Should you be building an email list? Join Angus and only as they discuss whether you should be building an email list of people that are “interested” in your services. Hint: YES YOU SHOULD!!!! Email is not dead – it still has WAY better reach than a social media post and there are many ways to build your database. In this episode, Tony and Angus discuss the 4 P’s to having a THRIVING practice. You can listen to the Podcast in iTunes or Stitcher. 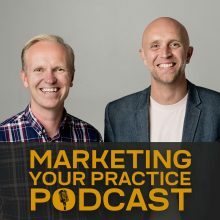 Search for the Marketing Your Practice Podcast. Here’s a link: iTunes. Stitcher. What we learnt from a social media master. We had the great please use of sitting knee to knee with Lola Berry and asked her about her journey with Social Media for our upcoming Social Media Summit. Here, we discuss the lessons we learnt from the interview. Should you be going ALL IN with Live Streaming?